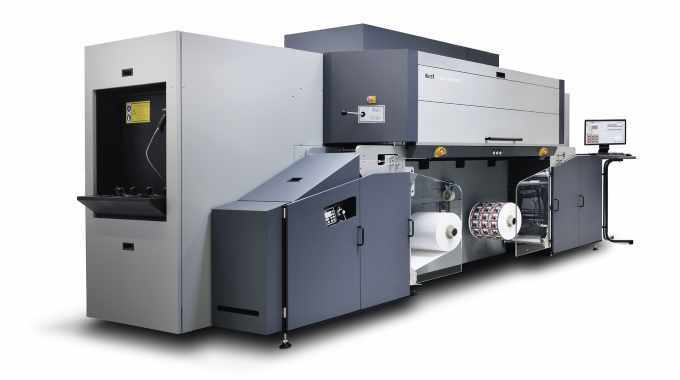 The Tau 330 RSC E UV inkjet single-pass press is available with 330mm and 244mm print widths, and in 4-color or 4-color plus white configurations. Its native resolution is 1200 x 1200 dpi, with a drop size of two picoliters. A production capacity of 1020 sqm an hour is achievable with a printing speed of 52 linear m/min at full color including white. High pigmented inks reduce ink consumption by up to 20 percent per sqm, optimizing running costs to the lowest possible level according to Durst. It is specifically targeted at small and medium converters in the mid-tier market, is priced from €350,000 EUR, and is field upgradable to the full Durst Tau RSC high-speed press (8-colors and 78 linear m/min (245ft/min). All options from the Tau 330 RSC can be fitted to the new model, including chill roller, variable data printing or external jumbo winders. Helmuth Munter, segment manager, label and packaging printing at Durst, said: ‘During the development of the Dust Tau 330 RSC E, a special focus was dedicated to the upgradeability and flexibility of the press. This is an important addition to the Durst Tau RSC family of variable, versatile, adjustable and configurable machine systems.